Tropical Depression 4E formed in the Eastern Pacific and crossed the 140 West longitude line as of the 0300 UTC time, which brought it into the Central Pacific Ocean. 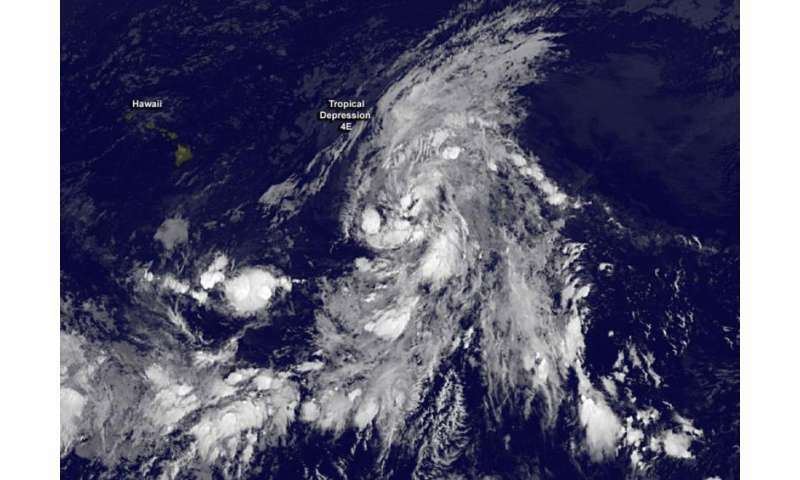 NOAA's GOES-West satellite captured an infrared image of the depression at 0900 UTC (5 a.m. EDT) on July 8 that showed the large storm in the Central Pacific. At 8 p.m. PDT/11 p.m. EDT on July 7, (0300 UTC on July 8), the center of newly formed Tropical Depression Four-E was located near latitude 15.4 North, longitude 140.2 West. The depression was moving toward the west-northwest near 17 mph (28 kph) and this general motion is expected to continue for the next 48 hours. Maximum sustained winds are near 35 mph (55 kph). The National Hurricane Center noted that some strengthening is forecast during the next 48 hours, and the depression is expected to become a tropical storm later Tuesday night (July 8) or early Wednesday, July 9. The estimated minimum central pressure is 1005 millibars. Tropical Depression 4E has now moved into the Central Pacific Ocean, and the future forecasts will be issued by NOAA's Central Pacific Hurricane Center in Honolulu, Hawaii. The GOES satellite image showed a large storm with fragmented bands of thunderstorms wrapping into the low level center from the north and south. The image was created by the NASA/NOAA GOES Project at NASA's Goddard Space Flight Center, Greenbelt, Maryland. NHC noted that in four days, the system is expected to weaken and become more vertically shallow, and be steered westward by the low-level easterly trade wind flow.